Home » Embroidery from the Caucasus, Greece, Indian Melicete tribe. 19th century. Circassian embroidered Saddle-Cloth. 2. Embroidered dress, Greece. Hand-work of the North-American Indian Melicete tribe. FROM among the few but remarkable specimens of art-work man ship contributed to the Exhibition by the Caucasian Agricultural Society of Tiflis, we have selected a saddle-cloth from Kabardah, a district to the east of Mount Elbruz, the highest summit of the great Caucasian mountain-range. 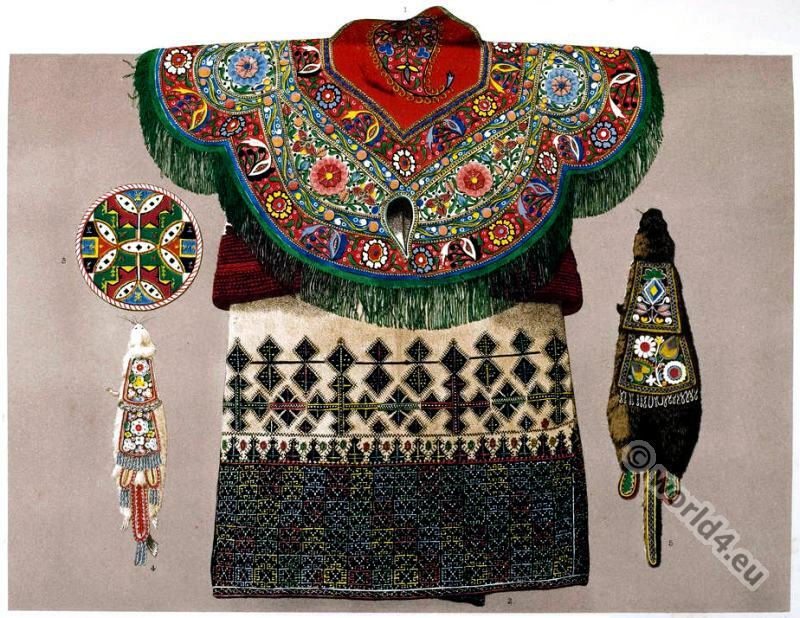 It was beautifully embroidered in coloured silk and cotton, and resembled very closely in style the saddle-cloths of north-eastern Turkey and Persia, from whence its system of decoration is doubtless derived, as the introduction of the pine pattern tends to show. The colours were excellently blended, and the pommel of the saddle, of embossed copper-gilt, was inlaid with cornelians, turquoises, and medallions. The cloth itself was placed on an oblong-shaped leather saddle, having a roughly-embossed and painted border, the ground of which was pounced. The Greek peasant’s dress, embroidered with coloured thread on coarse cloth, was forwarded from Steni, in the demos or commune of Lelantion, and is remarkable for the pattern worked upon it, which bears no relation to the convoluted style generally practiced in Greece and the Ionian Islands, and which is generally regarded as peculiarly national. In this case the pattern is such as is made by the peasants for their own use, and bears in every respect the impress of the old Byzantine style of ornamentation, an impress observable also in the Greek carpets, which bore an analogy to those of Turkey and the Caucasus. In gold embroidery, Greece still retains its peculiar and well-known style. Some remarkably rich specimens were exhibited; but they have been so frequently illustrated in former works, that we did not deem it advisable to reproduce them, especially as, though rich in effect, they are not peculiarly meritorious in design. The finest pieces were contributed by D. Nicolau, C. Papacostas, G. Theodorou, and C. Tstaulyas, of Athens, the two first-named being rewarded with prize medals for splendid embroidery applied to national costumes. Andreou & Zenou, of Athens, also obtained a prize medal for a richly-embroidered table-cover. The national style of decoration in Greece requires an impulse and development, which we trust, under its new monarchy, it will receive. Manipulative power is not wanting; wherever delicate and fine work is required, the small-handed Greek is peculiarly fitted to the task, as witness those miracles of minute wood-carving in the old Byzantine style, “The Coming of our Lord,” by Agathangelos, of Athens, and other works of the same class by Praourdakes and Papageorgiou, of the same city. The remaining subjects in our Plate are two purses or pouches, embroidered with bead-work on cloth, stitched to the skins of animals: and a coloured straw woven mat, the hand-work of the North-American Indian Melicete tribe, contributed by Thomas Daniel, Esq., Acting Commissioner for New Brunswick, who exhibited a large number of articles made by this tribe, though nothing, we believe, by the Micmacs, the only other Indian tribe settled in New Brunswick. Amongst them were particularly noticeable a war dress, embroidered with beads on black and red cloth, the work of an Indian squaw; articles in dyed straw, of excellent design and harmonious colour; pipes of stone with bone stems, exceedingly curious, quaint, and original; and lastly, caps, gloves, pouches, &c, of bead-work, from which we have given two pouches, one formed from the ermine’s skin and the other from a rat, the upper portion of the two pieces of bead-embroidered cloth covering the opening to the skin pouch. That the half-savage tribes of North America have a strong tendency and taste for ornament was proved by the contributions from Vancouver’s Island. Rough and common as their productions may be, there was a wonderful amount of cleverness and originality evinced in their ornamentation. The boats, or canoes, were made to resemble monsters, with snout and mouth and eyes at the bow, which formed the head; the paddles were cleverly cut into the shape of fishes. The carved slate dishes were covered with geometrical, circular, and fan patterns; the blankets and dresses made of dog’s hair were worked with black spiral ornament, and eyes of the same description as are to be found on old Chinese work and on the shield from Borneo, contributed by Mr. St. John Spencer. The masks used by the dancers and others at festivals bore a most outrageously horrible expression; the fire-bags used by the hunters for carrying their flint and steel were nearly as good as those we have illustrated. The combs of wood and bone were very original, being shaped like forks, and surmounted with carved figures; and the very fish-hooks of bone were spliced to wooden figures of demons and nondescripts, which one would have thought sufficient to scare the strongest-minded fish of river or sea.